During the last two decades, we have witnessed a proliferation of studies and reports about sustainability. Regarding the business dimension, senior leaders of organizations create the sustainability vision, mission and strategy, leading to the creation of sustainable value, and an organizational culture of sustainability. Regarding the market dimension, consumers around the globe turn into attention to sustainable products banning companies and supply chains that do not operate under sustainable ethos. This book is well balanced around the aforementioned topics. It comes from a long co-operation of a number of researchers from different countries and diverse experiences in the fields of research, education and business consulting regarding sustainability. The strong connective links of the participants of this ‘think tank’ stand on common perspective, mutual understanding, trust and social responsibility. 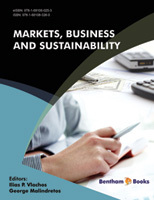 Overall, the readers will benefit considerably from this book since they will enrich their understanding on how Markets, Business, and Sustainability are interconnected. This eBook deals with the “sustainability issue”, focusing attention on the integration of the value creation supply chain network and the maintained dynamic upstream and downstream R&D process of collective feed-back interaction. It is addressed particularly to practitioners of technological and management expertise to facilitate broader active partnership with critical importance for improving the “collective capabilities” to maximize “synergy effects” to create sustainable competitive advantage in the new and irreversible economic, social, cultural, physical and technological environment. To promote understanding of the interfirm and interdisciplinary character of the sustainability issue and the diffusion of knowledge, special attention is attributed to the structure of this publication and the simplicity of the text. Increased awareness and better level of understanding strengthen the possibilities of transforming “challenges” into “opportunities”, based on collective inventive innovations for value and wealth creation. The required leverage and breakthrough re-engineering are actually a matter of a new culture and attitudes of collective action along with “human capital” and “social capital” development and co-ordination of different expertise, know-how and experiences, based on strategic, tactical and operational planning and consistent implementation to offer reliable paradigm and contribute to sustainability performance with potential future constructive perspectives.